A recent local accident has sent one woman to the hospital and resulted in property damage to three others, in addition to causing an hours-long backup during morning rush hour. The accident is a reminder of the importance of carefully checking for oncoming traffic before changing lanes, especially when traveling at high speeds. The accident occurred at approximately 6:00 am on Friday, August 26, 2016. The four vehicles involved in the accident were traveling north on Interstate 205, on the bridge near the exit to State Highway 14, when the crash occurred. A van driven by Seth Saidman, of Portland, attempted to merge into the lane to the right. Unfortunately, it appears that he failed to check behind his shoulder for oncoming traffic, and when changing lanes, struck the car next to him, a Honda Civic driven by Briana Clark of Vancouver. The impact caused the two vehicles to spin to the left shoulder, hitting the barrier, with Clark’s car bouncing back into the roadway. Clark’s car was then struck by a car driven by Sarah Nidick of Washougal, and again by a tractor-trailer driven by Singh Balraj, of Yuba City, California. Ultimately, Clark’s car was totaled, and Clark was sent to the PeaceHealth Southwest Medical Center, admitted in satisfactory condition. The other drivers avoided injury. Local law enforcement are currently investigating whether to file charges against Saidman for failing to safely change lanes. That said, while the merging driver has a duty to check for traffic, the victim may wind up bearing some portion of the fault for the crash if the at-fault driver can show that the victim could have acted to avoid a collision. 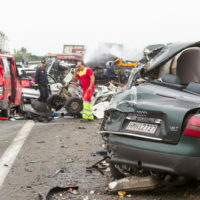 A skilled Washington car accident attorney can help lane-changing accident victims by gathering eyewitness accounts from the scene of the crash who can testify to the at-fault driver’s behavior, and can use accident reconstruction experts to demonstrate the inability of the innocent driver to avoid a crash. If you’ve been hurt in a car accident in Washington, seek the money you need to compensate you for your injuries and costs of treatment, including money for lost wages, medical expenses, and pain and suffering, by contacting the experienced and knowledgeable Vancouver personal injury lawyer John Lutgens for a consultation, at 360-693-2119.